Aguilae and his buddy, the squib Mace Windu, took thier names from the early Star Wars drafts, way way back in the early 90s. I don't think a color picture of Aguilae had existed until the story was posted in the Hypserspace section of the Official Site. 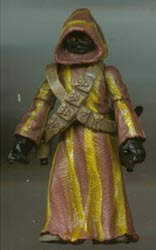 Basically a Jawa with yellow stripes, I was glad I got the 30AC Jawa, as I could remove the bandoliers, which made it a lot easier to do the stripes. Plus I now have a tiny vest to use down the line.